We've had a busy Summer enjoying lots of time outside in the beautiful warm weather. While outdoors we noticed the different insects around our garden, especially the many different varieties of bees that were attracted to our wildflower rainbow garden which we planted last year. As we observed the bees buzzing around it made us realise the value of this 'wild' space & we started to plan where we could plant another rainbow ready for next year. Then we began to think about how we could plant more rainbows to help even more insects & my mini gardener came up with a plan. 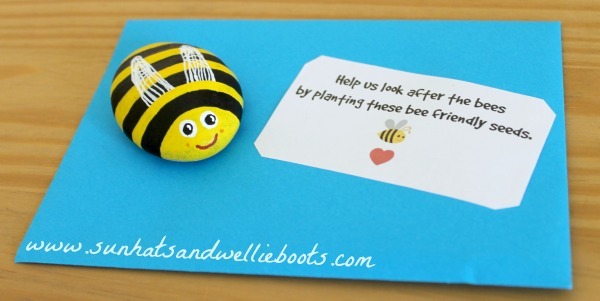 We could share some 'bee friendly plant seeds' so friends could plant Wildflower Rainbows in their gardens. The more rainbow gardens = the more flowers for more bees! We used packets of bee-friendly seeds along with packets of mixed seeds (wildflower garden mix). 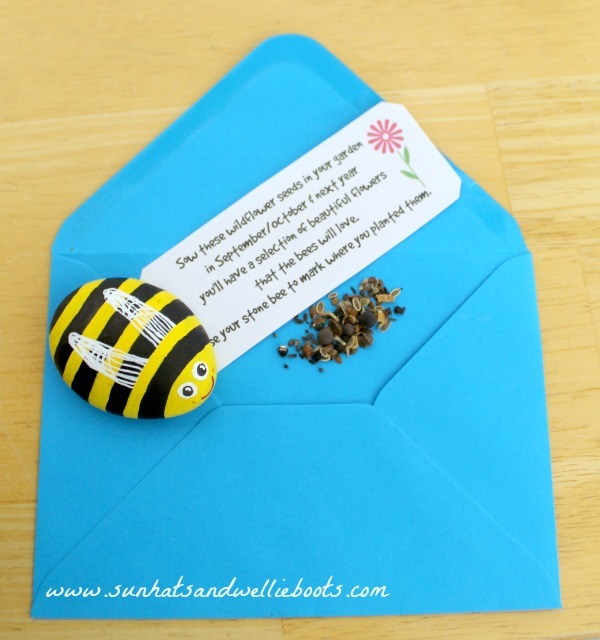 We also added seeds that we'd collected from our garden after the plants had flowered including; poppy, foxglove, nigella, marigold, & sunflower seeds. If you're unsure which flowers attract bees & butterflies check out this perfect for pollinators list from the RHS, or look for packets of wildflower seeds that indicate they attract wildlife. Sow these wildflower seeds in your garden in September & next year you'll have a selection of beautiful flowers that the bees will love! 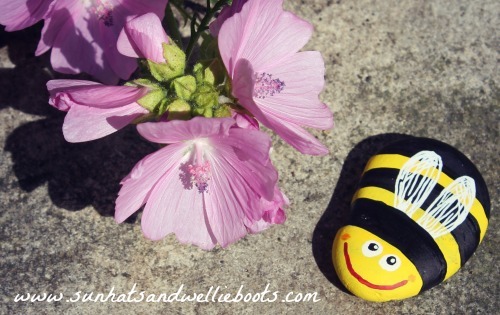 We'd been painting pebbles together last week & had created a family of bees, so along with the seeds, we thought we could add a bee pebble to act as a plant marker to remind folk where they'd planted the bee friendly seeds. Genius! 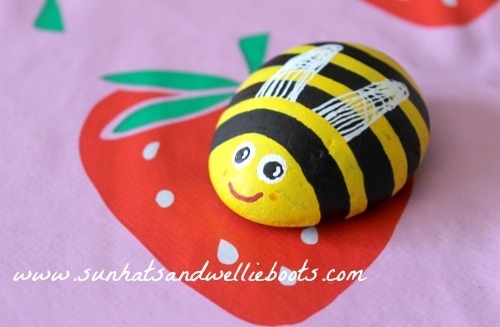 To create our bee pebbles we used sharpie paint markers which meant each design was bold & bright & because the ink is permanent & waterproof the pebbles can be left out in the garden throughout the year. 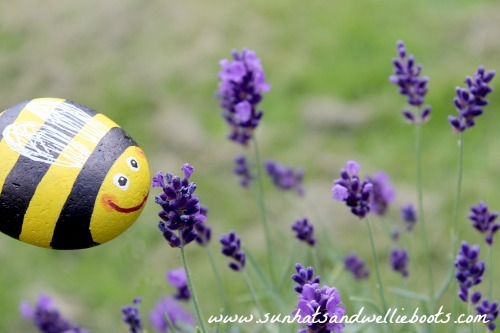 We thought we'd give each bee a name (my favourite was Buzz!) & soon we had a family of bees ready to fly off to different friends along with the wildflower seeds to create more mini rainbow gardens. Having seen the variety of insects that our mini Wildflower Rainbow has attracted over the Summer we're looking forward to hearing about the new bee-friendly gardens that will be popping up next Spring/Summer. Hopefully, they'll be attracting as many insects & bees as we've seen too. We hope you've bee-n inspired by this post & are keen to share a little love for these amazing insects which do so much for our ecosystem. 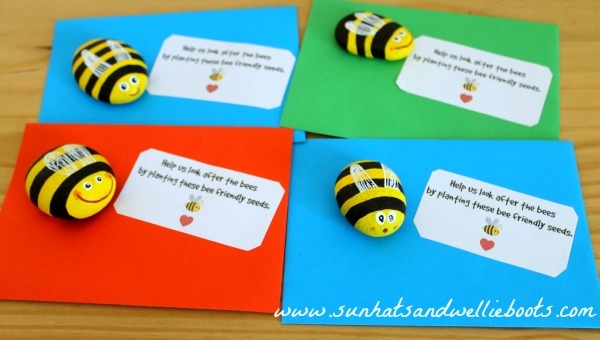 Why not pledge to make a couple of these beautiful bee pebbles & share them with friends or family along with some wildflower seeds, You'll 'bee' making a big difference to help these amazing creatures! Facebook, Twitter or Instagram account.